So, now is the time to make your WordPress blog colorful and dynamic with photographs and some videos! There are a many plugins that come with photo and video gallery options. These plugins, once installed let you to upload photos and display them in gallery style on your blog. We are going to cover such most popular plugins and help you to decide which one is the best for your WordPress driven blog. Here is the list. Flickr has always been a powerful platform to upload photos and of course it fit well with WordPress blogs. Once you install this plugin, configure your Flickr account in plugins settings page, the photos you add to Flickr gets directly uploaded to your WordPress blog. As easy as this. You can manage your Flickr albums within WordPress blog without even visiting Flickr.com site itself. This is yet another photo gallery that is known for its centralized gallery management. Here you can see and manage all your picture galleries from one place. NextGEN Gallery has options like inserting and deleting images, reordering images and resizing thumbnails. Plugin also offers batch uploading and compact or extended image gallery display. With Fotobook photo gallery plugin, your Facebook photo album can be inserted into WordPress blog within several minutes. Plugin supports photo import from multiple Facebook accounts. Based on official Facebook API’s its built according Facebook requirements for such apps. Required PHP5 to work. WP photo album plus is a photo gallery plugin that helps to manage and display your photo album in a user-friendly manner. Here, you have the option for creating albums along with their sub albums. It is up-to you to control the display sizes and there is no limitation for adding the photos. There is also an option called ‘photo of the day’ where you can insert a photo and get it displayed for the entire day, or hour or week. 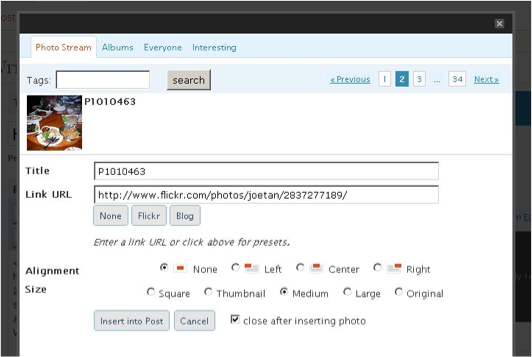 Picasa Photos was named for its originality and wide access. As you add photos to your Picasa album, they get directly displayed on your WordPress blog gallery. This auto sync feature is very useful if you are Picasa user and want to share photos from this great gallery app with your blog readers. 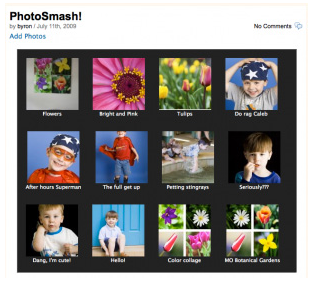 Photosmash Galleries WordPress plugin allows you to create photo galleries in your posts and pages. 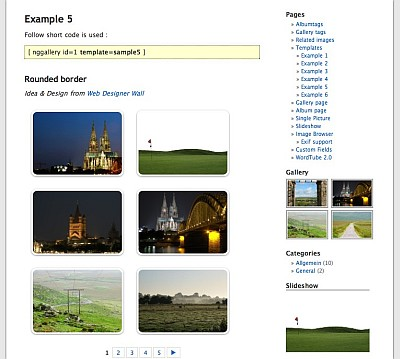 Plugin provides flexible models for designing a custom photo gallery and form layouts. Map your images with Google Maps, AJAX photo uploads from within posts and pages, star ratings for images, user contributable photos and many more features. Flash and jQuery media content plugin.You can: upload images, import music, video, create photo galleries, music playlists, slideshows, mp3 or video galleries. Another important feature is that galleries created with this plugin are mobile optimized and fit reader iPhones, iPads and rest of smart devices nicely. Plugin developers also highlighting work they did to make it SEO (Search Engine Optimization) ready. This plugin known for support for Video gallery creation and allows blog owners to build video playlists. It supports Amazon S3 Web Services for scalability and reliability by hosting media content in the cloud. Allows users to upload videos and contribute to your blogs video library and video playlists. iTunes and mp3 support makes it also suitable for any music / podcast media content you want to have on your WordPress blog. Creates a Flash Photo Gallery like one provided in Adobe Photoshop CS2 Flash Web Photo Gallery templates. This plugin is compatible with WordPress and WordPress MU. You can check demo gallery installation here. PICA is a photo gallery plugin that allows you to create a large collection of multiple albums. You can easily navigate from one photo to another. The images can be viewed in a full screen slide show and can be edited anytime. I like to read your blog. Itâ€™s really a very nice article.